Many people living in Nanaimo may already know about this place, but for anybody wanting a view of Departure Bay Ferries, there's a park called "Kinsman Park" on Departure Bay Road. 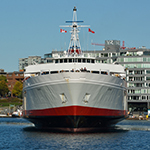 It provides a clear, and unobstructed view of the ferries arriving and leaving Departure Bay. And unless it's really high tide, you can walk between them (Departure Bay and Kinsman Park) fairly easily along the shore, then it's just a few more minutes to walk up Sugarloaf Mountain. Done that route twice. And here's another excellent ferry watching spot that I visited today (second time I've been here). Good thing it's hard to get to, otherwise it would be a very popular place... today it was almost deserted. Ugh, it's quite the hill to get to that beach. I am still surprised I made it down and back up when I tackled it a few years back with a buggered knee that ended up requiring surgery. 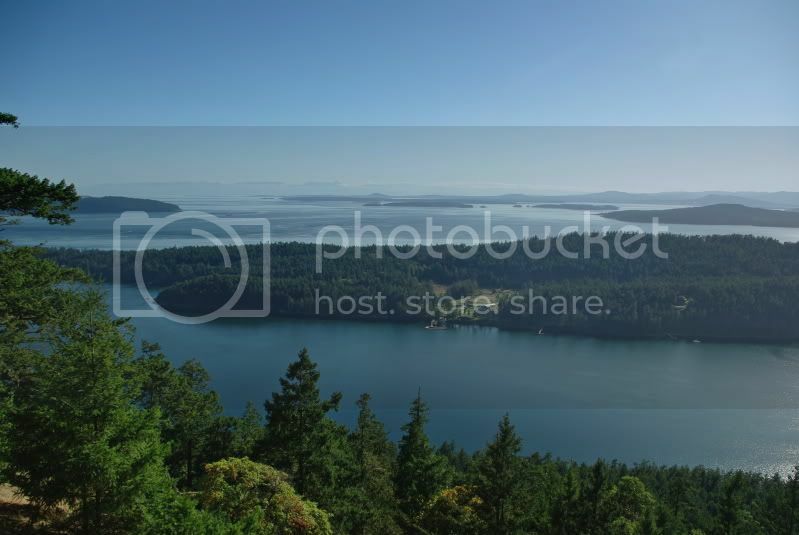 It's Matthews Point Regional Park on Galiano Island. Very nice beach there, basically deserted because of the long very steep narrow path down the side of the bluffs to the beach. On the lower part, there are ropes tied along the path to hold on to. Matthews Point Park is next door to Bluffs Park, and now there's actually a trail between the two... I saw the sign for it, but with 3 little kids, we just went to the beach for the day. The beach is mostly sandy and there are no facilities whatsoever, unless you count the old picnic table at the top of the bluffs. It's right in the middle of Active Pass, so the ferries often pass each other right in front of you and they often sound their horns right there as well. If there weren't so many wasps and sand fleas? ?, you might think you were in paradise, even if you didn't love ferries! Just go on a warm day during the winter! 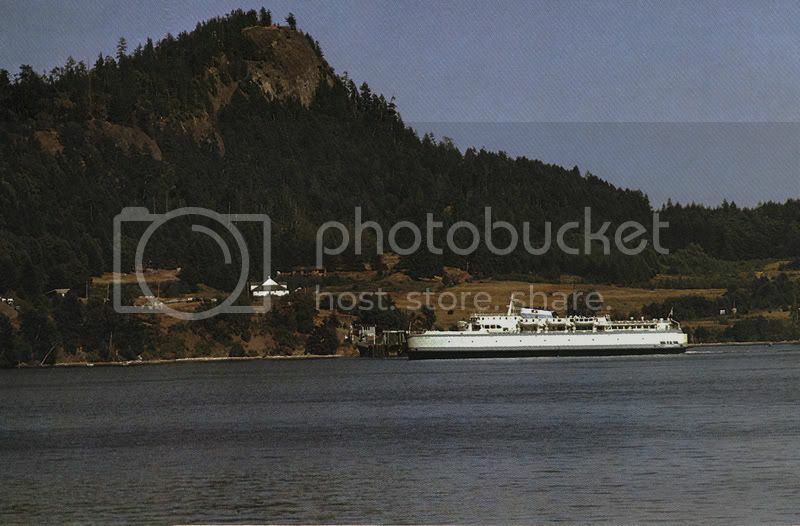 Queen of Tsawwassen departing the original single ramped Village Bay, Mayne Island, terminal in the Southern Gulf Islands before the terminal was upgraded with another berth that could be eventually double-ramped. Has anyone been up to the top of Mt. Parke (photo above) on Mayne Island that can tell us whether it would be good for ferry photos? It seems quite accessible (compared to Mt. Galiano for instance) but maybe a bit distant from the main ferry routes. Looks like it would have a good view of Village Bay though. I'm just not sure whether the park includes the summit or not. That looks like a great spot with excellent views, and with fairly easy access. I do not think that it has a view down into Active Pass, however. The trails look short enough to be 'kid friendly'. I recently found 3 good places on Gabriola Island. Good views of route 30 & 2 ships, and Seaspan too. The mountains on the mainland, and the Entrance Island lighthouse make this an interesting photo location. - Malaspina Galleries, which is only 3 km from the ferry landing. Good views of Route 30 & 2 ships, and Quinsam and Seaspan too. View is of the east sides of Protection & Newcastle Islands. You can look across to the Route-2 lane behind Snake Island, and also see the Route-30 & Seaspan ships pass right before you as they make their way around the tip of Gabriola. - Keith Rd (off of Canso Rd. ), which has a lookout (accessed from a short trail at the end of the dirt road) that is above the cliffs, which are opposite Northumberland Channel from Duke Point terminal. This gives good views of Duke Point and a single-ender spin. To get to this spot, start by turning right immediately off the ferry onto Easthom Rd (it's a very narrow 1.5 lane rd). I have only been to Gabriola once but there is a place directly across from that lighthouse that looks across that little light station. I dont know if it was an actual place or if we just stopped on the side of hte road. Where did you take your sig photo?? 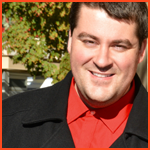 My sig-pic was taken from directly across from the lighthouse, in the place that you describe. - it's just a pull-off beside the road (Berry Point Rd. ), with room for a few cars to park, and a bench to sit on. It's technically called Orlebar Point. I've often wondered the same about going up there. There are cell towers up there now, so there has to be at least some sort of access road up there even. Looking at more recent photos though, it looks like the tree growth is a lot thicker these days. So it's hard to say if you'll have a good view up there. Here's an aerial photo I took back in May 2010 of Village Bay from a float plane. Gives you some sort of idea of what the view could be from up there. Looks like the tallest point on Mayne Island as well. Yes, that's the Queen of Nanaimo, and the tide was indeed ebbing through the pass at the time. Much better viewpoint is on Mt Norman, on South Pender. It's higher, and offers much more of a sweep. This shot looks over Bedwell Harbour, with the Olympics in the distance. I believe Mt Norman also offers a view of the approach to Swartz Bay. It's also considerably higher than 'Mt' Parke, which is really just a hill. 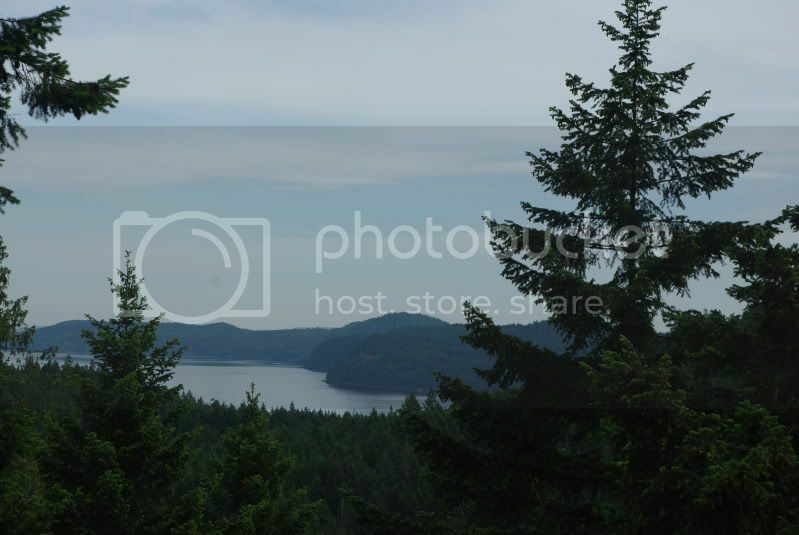 Here is the view from Sugarloaf Mountain in Nanaimo. 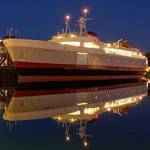 - it makes for a great ferry spotting location for Departure Bay routes. Here's an article from Trains magazine, that ferry-photographers might find interesting. 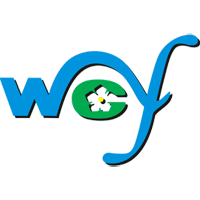 - I'm posting is here, so that it doesn't get lost in our trains thread. How many tourist attractions can you name that owe their existence to the art of railroad photography? I can think of only one: Morant’s Curve, three miles east of Lake Louise, on Canadian Pacific’s main line through the Canadian Rockies. Every tourist map and guidebook to these breathtaking mountains makes note of Morant’s Curve and urges travelers to see it themselves. Sure, you can list any number of great railroad locations that are well-known within the community of folks who like to photograph trains. And there is no shortage of railroad landmarks that have become familiar points of interest for the general public based on engineering accomplishments: Horseshoe Curve comes to mind, as does Canadian Pacific’s spiral tunnels, less than 20 miles west of Morant’s Curve. But this sweeping S-curve along the Bow River, framed by jagged mountain peaks, is a must-see location for practically anyone who visits the Canadian Rockies, thanks to the railroad photographs made there by Nicholas Morant, who held the title of special photographer for the Canadian Pacific for 50 years. At a plaque tucked along the shoulder of secondary Highway 1A (the busier Trans-Canada is out of sight across the river), visitors learn the story of Morant and the Canadian Pacific. His job was to make railroading in general, and CP’s style of railroading in particular, beautiful. Morant’s timeless views of Canadian Pacific streamliners dodging and weaving among towering mountains evoke so many different feelings — the allure of the wilderness, the urge to explore, the sheer wonder at the might of a railroad that opened up an entire nation. Such is the power of railroad photography. Few other types of photographs can convey so much meaning in one frame. And now, long after the last regularly scheduled streamliner shifted its route away from CP’s main line, travelers still come to the curve, some curious to know what’s so special about a bend in the railroad, others awed by a scene they can still recall from timetables, travel brochures, and countless publicity photos. I cannot think of another place that not only celebrates the art of railroad photography, but fashions it into a pastime that members of the public eagerly want to participate in. Photographing a train on this curve is a big deal. It’s something on par with seeing the Mona Lisa in Paris or gazing down on Manhattan from the top of the Empire State Building. Even the most pragmatic of visitors feels compelled to emerge from the car, camera in hand, and begin that familiar wait for a train. Not everyone has the patience for this exercise, of course. Some leave with images of little more than an empty set of rails, twisting along the bank of a gentle river. But when a freight train appears, the excitement is electric. Children jump up and down in glee. Adults dart and scurry along the roadside, vying for that perfect angle. Tour buses pull to the shoulder, and every eye from inside gazes at the moving tapestry of locomotives and freight cars. More than a few cameras are pressed to the window pane. And suddenly, for one brief moment, everyone around becomes a railroad photographer. It’s an amazing sight to behold. I wonder what the ferry equivalent is to Morant's Curve? 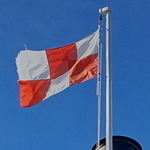 - A location where fine ferry-art has been produced and also where the general population takes many photos. I wonder if the closest ferry-equivalent is from the outside deck of a ferry in Active Pass, photographing the other ferry that is passing by? Thanks for posting that article, great read. 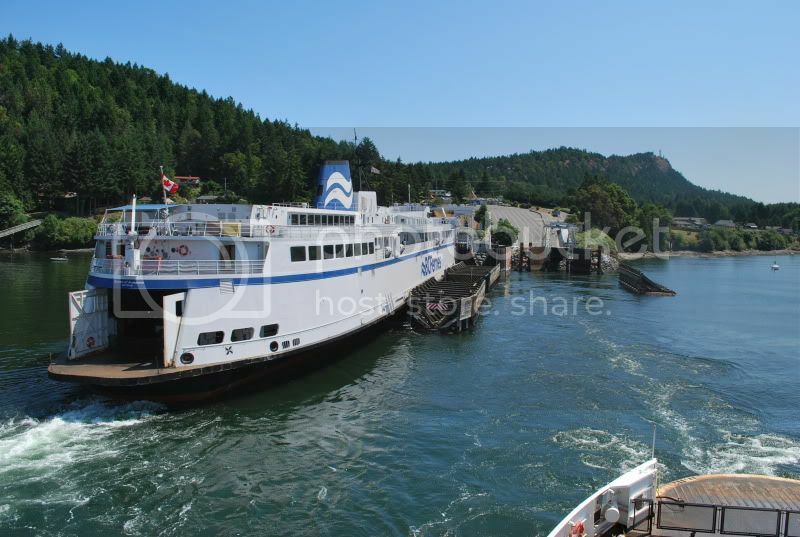 As far as a ferry equivalent, I think passing in Active Pass is a good suggestion, but I think the bluffs on Galiano, overlooking the pass is another close equivalent. 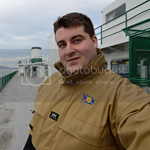 I have seen many people, not just ferry nerds, taking pictures there. 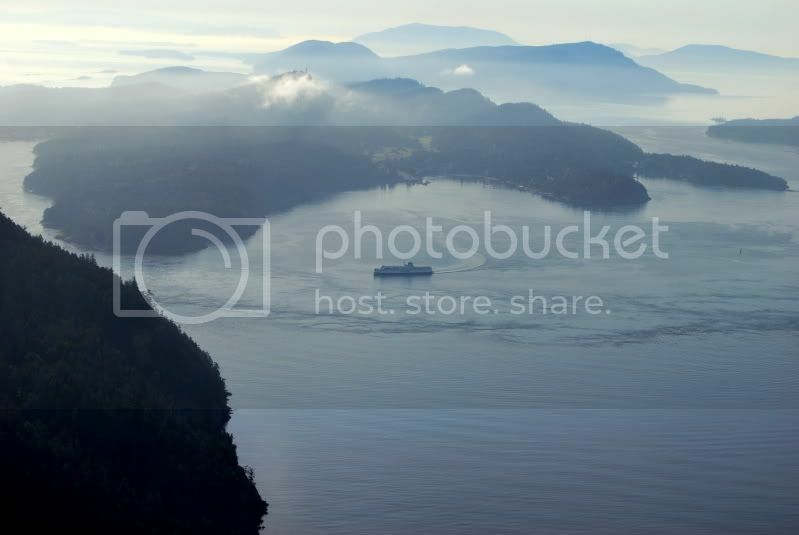 I would agree with Active Pass being 'the place' to photograph ferries in BC, but the Bluffs Park is less than ideal in my mind due to all the trees which invariably are 'in the way'. I prefer the cemetery as the place to shoot the passing ferries. There are some very good spots on Mayne also. Plus, don't forget that the bluffs face south-west-ish, which is exactly where the sun has a habit of setting. You can get some pretty backlit photos from there sometimes too. 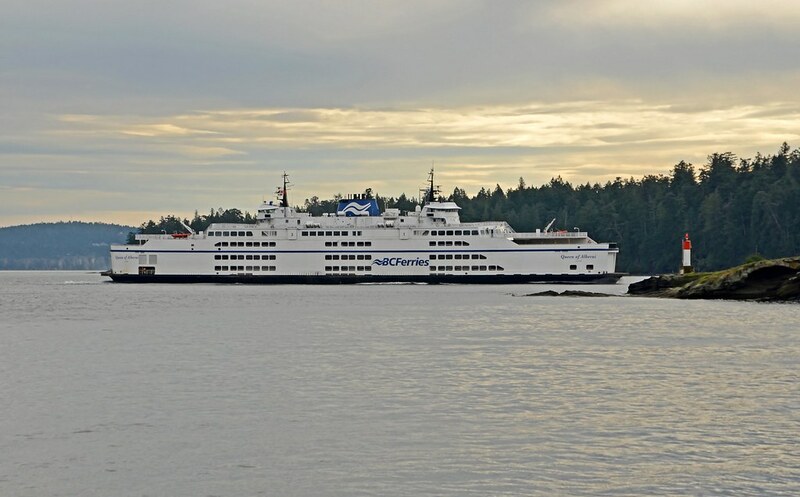 Yesterday, I enjoyed a day of ferry-spotting on Gabriola Island, mainly at Orlebar Point. This point is right across the channel from Entrance Island. There were lots of instances of ships passing, and once with 3 ferries in view and once with 4 ferries (a Seaspan item included) in view. It was a fun day, and good to have my car as a warm refuge out of the wind. But it was easy and fun to spend 8 hours on the island mainly watching ships and spending some in-between time reading and relaxing. ....and I had a wind-storm to watch too. Made for choppy seas and bow-spray on the ships, but also made for a cold photographer. A good place for viewing and photographing ferry action out of Horseshoe Bay, that I discovered today, is Copper Cove. From the remains of an old pier, you are able to get a good view of ships from all three routes out of Horseshoe Bay. Queen of Oak Bay and Queen Of Surrey off of Horseshoe Bay. Note remains of old pier in the foreground. Queen of Capilano approaching Horseshoe Bay. I think everyone agrees that Active Pass is a great spot for ferry spotting and that the outside decks of any one of the ferries make great platforms from which to do your ferry spotting. The following images posted by this account are copyright © S.A. ~ Unauthorized use is prohibited.